Runwal Pearl : A rare development of pure luxury, comfort and world-class features for a life of pure satisfaction! Thane is an incredible city in the state of Maharashtra that has a lot to offer its inhabitants. Being a part of the Mumbai Metropolitan Region (MMR), this city goes through constantly development and just keeps getting better in all sectors each day. Today, Thane is one of the most loved cities in the country that many want to be a part of. The real estate market in Thane is simply booming today with a number of residential and commercial spaces in different parts of the city. If you are looking out for a life of pure leisure and comfort, you have come to the right place. Runwal Pearl is a new residential project in Thane by Runwal Group that offers sophisticated beauty and lifestyle like no other! Runwal Group is known to offer marvellous creations that are truly detailed and this new development is no exception. Extended over beautiful acres of land, this development contain supreme towers (G +30) that offer 2BHK and 3BHK luxury apartments of different configurations that are crafted to perfection. With large apartment areas sizes, find the ultimate luxury apartment that you have always been looking out for without any hassles. 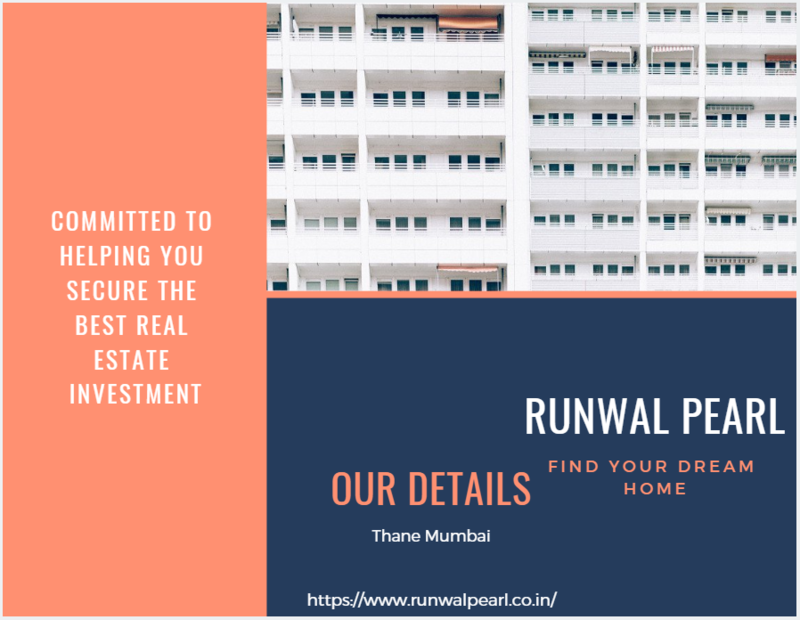 Runwal Pearl Mumbai is an exciting residential development that is packed with world-class features for premium luxury and comfort that will blow your mind! The apartments are spacious and, provide beautiful sunlight, ventilation and contain high-end fittings and fixtures, high-quality flooring throughout the apartment, fancy kitchens with granite tops and multiple provisions, tough doors, large balconies and windows providing landscape views of Yeoor hills, high-quality electrical ports located perfectly for easy access, hi-tech safety features and more. This development offers an elegant range of external amenities that will always keep you and your family active, healthy and entertained each day. The external amenities include a lavish clubhouse for recreation, well-equipped gymnasium and jogging to burn some calories and always stay fit, swimming pool to relax and unwind, meditation centre to attain inner peace, indoor/outdoor sports facilities to play your favourite games and a play-area for your kids, party hall for celebrations, landscape garden, pergola containing beautiful walkways and sit-outs, well-trained security and the list just goes on. Experience a divine lifestyle of peace and serenity like never before. Located at Ghodbunder Road in Thane(W), Runwal Pearl Thane West comes in close proximity to a number of your every day and emergency places, providing pleasing convenience each and every day. Places like schools colleges, institutes, malls, cafes, cinemas, restaurants, general stores, supermarkets/hypermarkets, car showrooms, banks, ATMs, medical centres, hospitals, petrol pumps, public transport and a lot more can be accessed in the shortest amount of time possible. The strategic location of this development makes every landmark a hop, skip and jump away! Who said that pure luxury comes at a high price? Starting at a mesmerising price of Rs. 93 Lacs. only, the Runwal Pearl price is affordable and totally worth the fabulous features that it has to offer. May it be a new home or an investment for future returns, an apartment at this development is definitely going to fetch you happiness and high-end returns each day! You can conveniently choose from a number of payment plans according to your convenience along with splendid home loan facilities through associated banks, NRI services and more. Come, be a part of the Runwal way of life! Ghodbunder Road is one of the most sought after localities of Thane. The soul soothing locales are exquisitely encircled by picturesque views of Yeoor Hills and mountainous terrains. The scenic landscapes are perfectly complemented by the strategic placement of Ghodbunder Road in the well-built, expansive network of highways.